The Mason County Commission presented Lloyd Akers with a $2,000 donation for the West Virginia State Farm Museum. 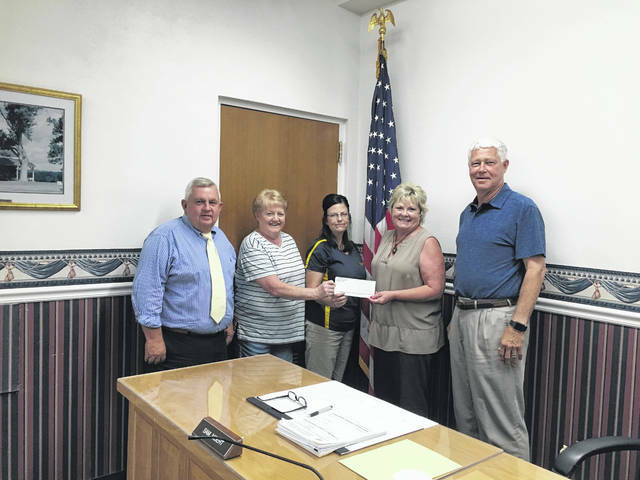 The Mason County Commission donated $10,000 towards the 4-H building fund. 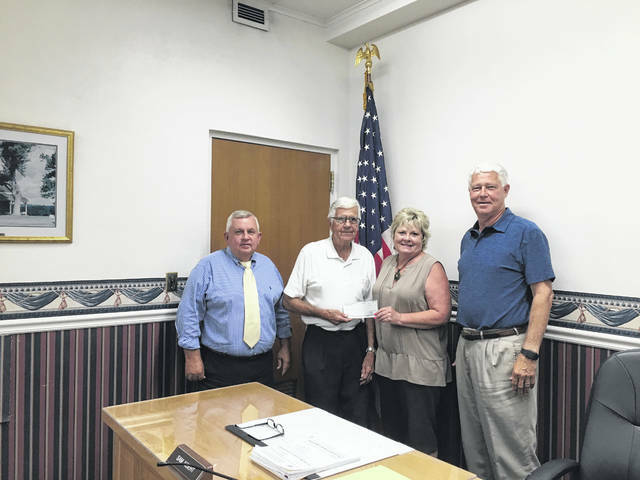 The Mason County Commission presented Jack Fowler with a $1,000 donation for the Point Pleasant River Museum and Learning Center. 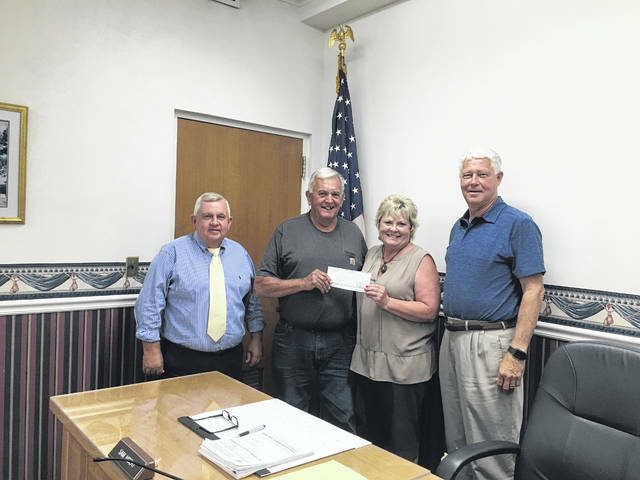 POINT PLEASANT — The Mason County Commission recently met for its regularly scheduled meeting, hearing updates on the Point Pleasant River Museum and Learning Center, West Virginia State Farm Museum, 4-H dining hall and U.S. 35. Jack Fowler, river museum director, was presented with a $1,000 check donation from the commission. Fowler gave an update on the status of the river museum, explaining the original building is empty. On Friday, Fowler met with the adjuster of the contents of the building and next Tuesday he will be meeting with the adjuster of the building. He commented the process of moving back in will take some time, he gave a projection of at least a year. Fowler explained some items were sent to Columbus, Ohio and Chillicothe, Ohio and some items are at the river museum’s current location. Lloyd Akers of the West Virginia State Farm Museum was presented with a $2,000 check donation from the commission. Akers said the farm museum stayed busy during the fair. He commented the hay ride during the Mothman Festival in September will be taking place again this year and the Country Fall Festival in October will be making its return. Akers said because of the farm museum’s age, there have been maintenance issues that need to be addressed. Lorrie Wright, extension agent, was presented with a $10,000 check donation from the commission for the 4-H building fund. Wright gave an update on the 4-H camp’s dining hall, explaining they are still in the process of getting the kitchen up to the fire marshal code. Wright also gave an introduction to the extension office’s newest agent, Ben Goff. Goff was hired as an agricultural and natural resources agent for Mason and Putnam counties in July. In other business, the progress of the U.S. Route 35 project was discussed. Cliff Farley, on-site project supervisor for the U.S. Route 35 project, reported he has paid estimate number 35, $171,500,000. Farley said the projected date for the completion of this portion of the contract, the grade and drain project, has been extended from Oct. 31 to Nov. 13. He gave the completion status of the four sets of bridges. Farley said they will be adding an intersection at County Route 19 over County Route 7, Jeffers Ridge Road, by a change order. He reported in regards to the Buffalo Bridge connector, they have the south connector and it will be a diamond shape interchange. He explained Kanawha Stone has been working on the north end connector due to a change order and will work up to the guard rail, the completion of that connector is projected for mid-October. After this portion of the project is completed, then steps towards the second portion of project can be made. Farley reported the new roadway is estimated to be ready by the fall of 2020. Residents who live along Route 35 where the work is being done were in attendance and addressed their issues concerning the project to Farley and the commission. The commission discussed an office of change within the New Haven Volunteer Fire Department. In a letter from Fire Chief Stephen Duncan, he explained Cpt. Jeffery Zerkle resigned from the department on Aug. 6. Matthew Gregg was then promoted to the Captain position and Thomas Anderson was elected to the Lieutenant position effective Aug. 6. Zerkle stated all other offices remain unchanged. Also the commission discussed a second letter sent by Zerkle thanking the commission for the additional funds appropriated to the New Haven Volunteer Fire Department. The commission approved William D. Black to be hired as an entry level process server to begin Sept. 1 at the Mason County Sheriff’s Office.